AKI is a major cause of morbidity and mortality and an important contributor to the development and progression of CKD. Molecular biomarkers that improve the detection and prognostication of AKI are therefore required. We assessed the utility as such of BPI fold-containing family A member 2 (BPIFA2), also known as parotid secretory protein, which we identified via a multiplex quantitative proteomics screen of acutely injured murine kidneys. In physiologic conditions, BPIFA2 is expressed specifically in the parotid glands and is abundant in salivary secretions. In our study, AKI induced Bpifa2 expression in the kidneys of mice within 3 hours. Furthermore, we detected BPIFA2 protein in plasma and urine in these models as early as 6 hours after injury. 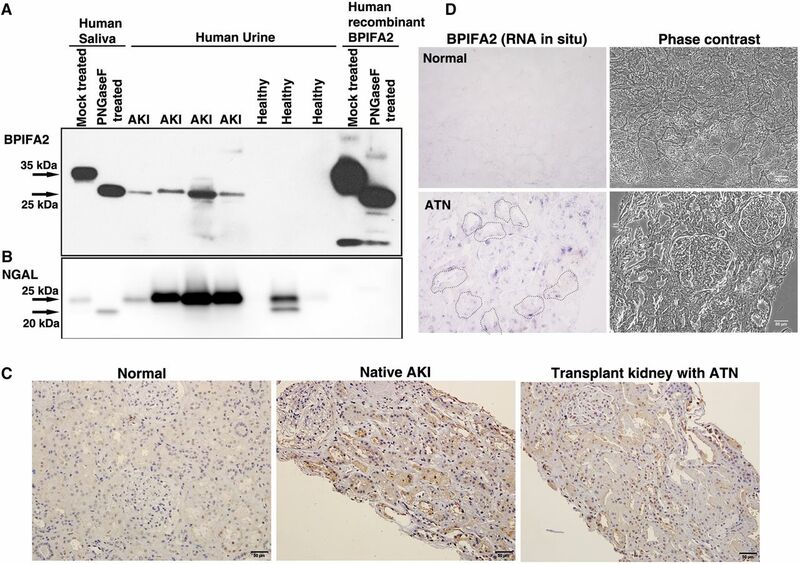 However, renal injury did not induce the expression of Bpifa2 in mice lacking Nur77, an immediate early gene expressed in the kidneys during AKI. Notably, patients with AKI had higher blood and urine levels of BPIFA2 than did healthy individuals. Together, our results reveal that BPIFA2 is a potential early biomarker of AKI. AKI is an increasingly common and important cause of morbidity and mortality in the United States and worldwide.1,2 Early detection is key to improving outcomes in AKI, which have not improved substantially over the past several decades. In order to identify novel pathways and proteins involved in kidney injury and repair, we studied temporal changes in the kidney proteome after acute injury. We used a multiplexed quantitative proteomics approach following tandem tag based mass spectrometry, a new technology that enables protein identification and quantitation from multiple samples simultaneously using a label-free system.3–5 Multiplexed quantitative proteomic analyses were performed using whole kidney lysates from sham operation (6 hours) and ischemia-reperfusion injury (IRI) after 30 minutes of bilateral ischemia, collected at different time points representing early, mid, and late phases of injury, and early repair phase of AKI (6, 24, and 48 hours, and day 7). In this unbiased global proteomics screening platform, a total of 6906 proteins were quantified across five distinct kidney samples, with a false discovery rate of 1%. Among these, 26 proteins showed an over six-fold increase in abundance at 24 hours postinjury, but only eight showed an increase of over six-fold at 6 hours postinjury (Figure 1A, Supplemental Table 1), including well known protein markers of kidney injury, Kidney injury molecule-1 (KIM-1/HAVCR1) (>1.6-fold at 6 hours, >28-fold at 24 hours) and Heme oxygenase-1 (Hmox-1) (>13-fold at 6 hours, >7-fold at 24 hours). Excluding major urinary proteins, which are not conserved in humans, only two proteins (HMOX1 and BPIFA2) had an increased abundance of over eight-fold as early as 6 hours postinjury (Figure 1A). HMOX-1 is the inducible form of HEME OXYGENASE-1, whose transcript and protein levels are highly upregulated during renal injury6,7 and inversely correlate with recovery from AKI in mice and humans.8,9 BPIFA2 showed significant upregulation in the injured kidneys early on (>9-fold at 6 hours, >7-fold at 24 hours; Figure 1A) and reached undetectable levels by 48 hours postinjury. BPIFA2 is an abundant protein in salivary secretions and its expression is specific to parotid glands in adult mice and other mammals, with little or no baseline expression detected in other major tissues, including kidneys.10–12 The robust and transient changes in protein abundance after injury in our quantitative mass spectrometry analysis, as well as its known secretory and antimicrobial properties,13–15 led us to focus further on the kinetics of Bpifa2 expression in three different mouse models of AKI. In the bilateral renal IRI model (Supplemental Figure 1), Bpifa2 transcripts were undetectable in sham-operated kidneys, whereas upon AKI, the transcripts began to appear at 3 hours and peaked at 12 hours (Figure 1B). In contrast, mRNA expression of two closely related family members, Bpifa1 and Bpifa3, were completely undetectable. Accumulation of BPIFA2 protein in the kidneys was observed at 6 hours postreperfusion by Western blot analyses (Figure 1C). Induction of BPIFA2 in injured kidneys was studied by immunohistochemical analyses, where the protein was predominantly detected in the proximal tubules as well as in the glomeruli (Figure 1D). We further utilized a Bpifa2-targeted mutant mouse strain [Bpifa2tm1(KOMP)Vlcg] carrying a lacZ reporter gene driven by Bpifa2 promoter at the endogenous locus (Supplemental Figure 2) to probe for AKI-induced Bpifa2 promoter activation in vivo in renal proximal tubular epithelial cells. In this reporter mouse line, Bpifa2 promoter-dependent β-galactosidase expression was detected in the proximal tubules upon IRI and not in sham-operated control kidneys, corroborating Bpifa2 induction in kidneys during AKI (Figure 1E). Subsequently, Western blot analyses revealed that BPIFA2 protein is readily detected in plasma and urine after AKI (Figure 1, F and G). Next, we evaluated Bpifa2 expression in a cisplatin-induced AKI model (Supplemental Figure 3). Evaluation of Bpifa2 mRNA (Figure 2A) and protein (Figure 2B) levels showed specific increases after cisplatin administration, and the expression persisted well beyond 48 hours. Interestingly, similar to the IRI model, BPIFA2 protein was detectable in the plasma and urine after kidney injury (Figure 2, C and D). Further, we also detected BPIFA2 protein in the plasma in an endotoxemic model of AKI (Figure 2E). BPIFA2 levels increased as early as 3 hours post–LPS administration and continued to be detected at 24 hours. Thus, our analyses demonstrated that after kidney injury, Bpifa2 expression is detected in murine kidneys and the protein levels rise rapidly in plasma and urine. AKI triggers BPIFA2 expression in kidneys and is detected in plasma and urine in a bilateral renal IRI mouse model. (A) Heatmap depiction of temporal abundance of proteins highly enriched in kidneys at 6 hours postreperfusion compared with sham operation. (B) Bpifa2 gene expression is induced in injured kidneys as assessed by quantitative RT-PCR. Fold values are in relation to 3 h time point. (C) Western blot analysis of protein levels of BPIFA2 in kidneys upon AKI. (D) Injury-induced BPIFA2 was mainly detected in proximal tubular epithelial cells as assessed by costaining with LTL and in glomeruli (indicated by white arrows). Original magnification, ×20; scale bar = 50 μm. (E) Bpifa2 promoter activation in vivo in renal proximal tubular epithelial cells upon AKI was evidenced by β-galactosidase staining in the Bpifa2 promoter-driven lacZ reporter strain. Original magnification, ×40; scale bar = 50 μm. BPIFA2 was readily detected in (F) plasma and (G) urine as early as 6 hours postreperfusion. PG, Parotid gland. Bpifa2 expression is induced in multiple models of AKI and Nur77 is an upstream regulator of Bpifa2 expression. Cisplatin-mediated AKI induces (A) Bpifa2 expression in the kidneys as assessed by quantitative RT-PCR and BPIFA2 protein was detected in (B) kidney lysates, (C) plasma, and (D) urine by Western blot analyses. (E) Plasma BPIFA2 was detected during endotoxin-induced injury. 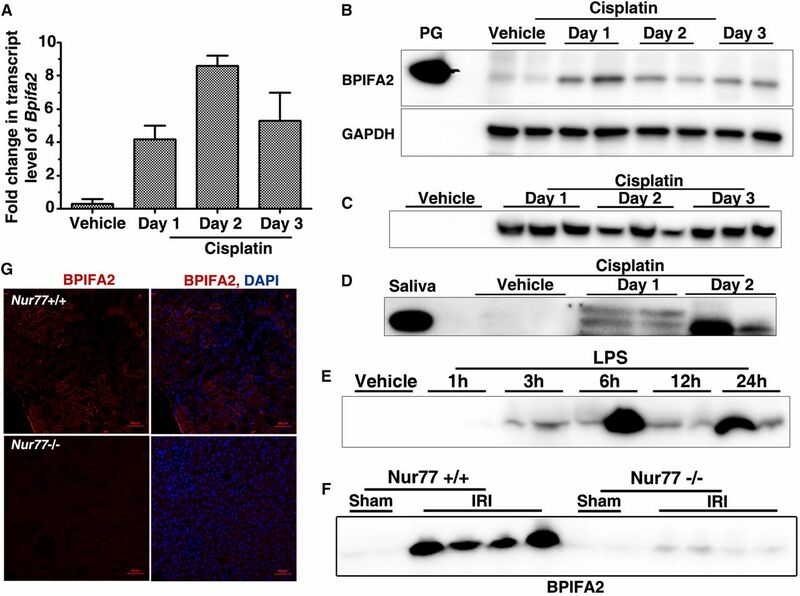 AKI-mediated induction of BPIFA2 was perturbed in Nur77−/− mice as assessed by (F) Western blot analysis of plasma levels of BPIFA2 and (G) confocal microscopic analysis of BPIFA2 expression in Nur77+/+ and Nur77−/− mice kidneys at 24 hours postrenal IRI. Scale bar = 50 μm. PG, Parotid gland. To understand the regulation of renal Bpifa2 expression, we analyzed the upstream regulatory regions for binding sites of known transcription factors. We identified NGFI-B response elements (NBRE) consensus sites (AGGTCA), a recognition sequence for the NR4A family of transcription factors within 2-kb upstream of transcription start sites in both human (two sites) and mouse (three sites) BPIFA2 (Supplemental Figure 4). We previously identified Nur77 (Nr4a1), a member of the NR4A family of transcription factors, as a key mediator of early injury response during AKI and a mediator of renal tubular apoptosis.16,17 As shown previously,16 Nur77 is robustly induced during AKI beginning in the ischemic phase and reaching a maximum at 3 hours postreperfusion, the earliest time when Bpifa2 transcripts are detected in the renal IRI model (Figure 1B). To further delineate the functional significance of observed core NBRE sites in the Bpifa2 promoter and plausible regulation by NUR77 during kidney injury, we tested if Bpifa2 expression is altered after renal IRI in Nur77−/− mice. After AKI, plasma BPIFA2 was readily detected in Nur77+/+ mice, whereas there was little or no detectable level in Nur77−/− mice (Figure 2F). This observation was further corroborated by lack of BPIFA2 detection in Nur77−/− kidneys at 24 hours post-IRI, whereas proximal tubular staining of BPIFA2 was seen in Nur77+/+ kidneys at the same time point (Figure 2G). Importantly, we have previously observed that Nur77−/− kidneys sustain less injury in this AKI model.16 Diminution of BPIFA2 in plasma and kidneys in these mice after AKI further corroborates that BPIFA2 levels correlate with severity of renal injury. These results suggest that NUR77 is a key transcriptional regulator of AKI-induced expression of Bpifa2 in kidneys. Compelling observations in multiple mouse models of AKI, as well as elucidation of the mechanistic basis for its expression in kidneys upon AKI, prompted us to evaluate if BPIFA2 expression is increased in human AKI. We evaluated a total of 30 urine samples from healthy individuals and 24 samples from patients with AKI for the presence of BPIFA2 by Western blot analysis. AKI urine samples were derived from patients with diverse causes of kidney injury, including acute tubular necrosis, postoperative AKI after cardiac surgery, hepatorenal syndrome, and contrast nephropathy. BPIFA2 protein was readily detectable in AKI urine samples at the predicted molecular mass of 25 kDa (Figure 3A, lanes 3–6), whereas no detectable signal was observed in the samples collected from healthy individuals (Figure 3A, lanes 7–9). Human saliva as well as human recombinant BPIFA2 protein served as positive controls, which revealed higher molecular mass bands (Figure 3A, lanes 1 and 10). Analysis of protein sequence suggested possible N-glycosylation of BPIFA2 (Supplemental Figure 5), consistent with earlier studies.18 PNGaseF treatment of saliva and recombinant protein to specifically remove N-glycans resulted in protein mobility similar to that of urinary BPIFA2 (Figure 3A, lanes 2 and 11). NGAL, an established AKI biomarker,19 showed a similar trend to that of BPIFA2 in the same urine samples (Figure 3B). BPIFA2 was also detected in plasma from patients with established AKI (Supplemental Figure 6). Western blot analyses revealed two distinct forms of BPIFA2 (18 and 15 kDa) in circulation. Next, to probe if BPIFA2 protein can be detected in human kidneys after AKI, biopsy samples from normal human kidneys and patients with histologically demonstrated acute tubular injury/necrosis were subjected to immunohistochemical analysis. BPIFA2 was highly expressed in injured tubules (Figure 3C). Unlike mice, BPIFA2 expression in human kidneys was detected in both proximal and distal tubules upon injury. We further confirmed kidney intrinsic expression of BPIFA2 in human kidneys upon acute tubular injury/necrosis by RNA in situ hybridization analysis (Figure 3D). Transcriptional induction of BPIFA2 RNA in the human proximal tubular cell line, HK2, was also observed in an in vitro ischemia/reoxygenation model (Supplemental Figure 7). Similar to other known AKI biomarkers, our analyses indicate that BPIFA2 is also induced during CKD conditions both in mice and humans (Supplemental Figure 8). Urinary BPIFA2 is a biomarker of human AKI. Western blot detection of urinary (A) BPIFA2 specifically in human AKI samples (lanes 3–6) and not in normal samples (lanes 7–9), similar to that of (B) NGAL. The mobility of urinary BPIFA2 resembles that of unglycosylated form of human salivary BPIFA2 (lane 2, panel A) and human recombinant BPIFA2 (lane 11, panel A), as evidenced from PNGaseF treatment. BPIFA2 expression was detected in human kidney biopsy samples with demonstrated acute tubular necrosis as assessed by (C) immunohistochemistry of BPIFA2 protein (original magnification, ×20; scale bar = 50 μm) and (D) RNA in situ hybridization analysis of BPIFA2 mRNA (original magnification, ×20; scale bar = 50 μm). A number of proteins identified in this screen, including KIM-1,20 S100A8,21 and SPP1,22 have been previously reported to be modulated during AKI and are potential biomarkers of intrinsic tubular injury. Because the enrichment analysis was on the basis of fold change over steady state and the proteins were ranked on the basis of abundance at 6 hours postinjury, the increase in NGAL level may have been masked by relatively higher abundance at steady state and increased cellular secretion upon injury; nonetheless, it was quantified in the screen and is one of the highly abundant protein in the injured kidneys. Our study has elucidated that Bpifa2 expression is induced in kidneys early after ischemic, septic, and nephrotoxic AKI, and is a potential biomarker of AKI in mice and humans. Upon induction of AKI following renal IRI, Bpifa2 expression was detected only in kidneys and not in liver tissue, which is a major source of acute-phase proteins, including NGAL and lipopolysaccharide binding protein (Supplemental Figure 9). Acute injury induces expression of multiple immediate early genes, including c-fos, Egr-1, and Nur77 in kidneys,16,23 which dictate a second wave of gene expression. Bpifa2 gene regulatory regions have multiple NBRE consensus sites in both mice and humans, and AKI-induced expression of Bpifa2 in the kidneys was significantly reduced in Nur77−/− mice. 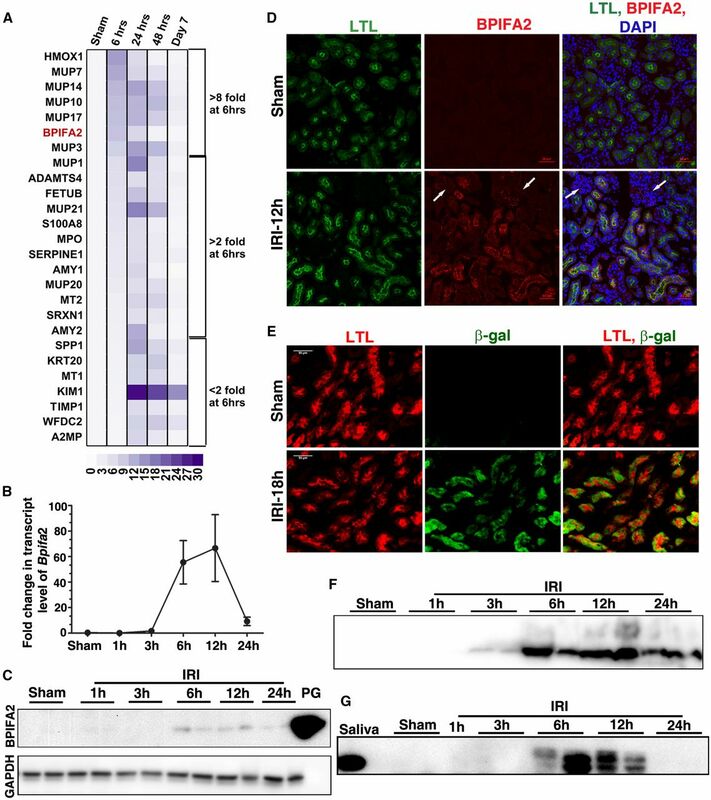 Altogether, kidney tubule–specific BPIFA2 transcription and promoter activity was clearly detected in injured kidneys in vivo. A number of antimicrobial proteins and peptides are expressed throughout the nephron segments in the kidney, including the proximal tubules.24 Interestingly, expression of some of these antimicrobial proteins, including Ngal and ribonuclease 7, are augmented during renal injury or urinary tract infection.25–27 Altered expression of antimicrobial proteins are often tied to proinflammatory milieu as well as impaired cellular metabolism, conditions also evident during kidney injury. Given the role of proinflammatory pathways in ischemic and septic forms of AKI and the known LPS sequestration properties of BPIFA2, an anti-inflammatory role of BPIFA2 during kidney injury is an interesting possibility that requires further investigation. The relatively dynamic and restricted expression pattern of BPIFA2 makes it an attractive AKI biomarker as well as a candidate to monitor recovery postinjury. Further, BPIFA2 is abundant in salivary secretions and although not analyzed in this study, changes in salivary BPIFA2 levels could be an interesting area of future research in AKI detection and it is plausible that parotid glands may also contribute toward the acute rise in plasma and urine levels of BPIFA2 protein after kidney injury. Future studies involving large prospective cohorts are required to evaluate the potential utility of BPIFA2 in prognosis and risk stratification of AKI in humans. Detailed methods are provided in the Supplemental Material. All mice studies were approved by the Institutional Animal Care and Use Committee at Beth Israel Deaconess Medical Center (Boston, MA). Human urine and plasma samples were obtained from a cohort study approved by the Institutional Review Board at Brigham and Women’s Hospital (Boston, MA). We thank Dr. Martin Pollak and Dr. S. Ananth Karumanchi from the Division of Nephrology, Beth Israel Deaconess Medical Center, for their support. We also thank Dr. Ryan Kunz and Dr. Sanjukta Guha Thakurta at the Thermo Fisher Scientific Center for Multiplexed Proteomics at Harvard Medical School for technical and analytical support for the proteomics analysis. This work was aided by research support from the Department of Medicine, Beth Israel Deaconess Medical Center and by grants R21AG047412 (to S.B.K. from the National Institutes of Aging); U01DK085660, R01DK093574, U01DK104308, and R01DK103784 (to S.S.W. from the National Institute of Diabetes and Digestive and Kidney Diseases [NIDDK]); K01AR069197 (to S.K.K. from the National Institute of Arthritis and Musculoskeletal and Skin diseases); and K23DK106448 (to D.E.L. from NIDDK). This article contains supplemental material online at http://jasn.asnjournals.org/lookup/suppl/doi:10.1681/ASN.2016121265/-/DCSupplemental.